A Russian Soyuz rocket carrying two cosmonauts and a NASA astronaut blasted off from Kazakhstan Wednesday, climbed smoothly into orbit and docked with the International Space Station after an abbreviated six-hour rendezvous, boosting the lab's crew back to six. The mission kicks off an exceptionally busy few months aboard the space station, with the arrival and departure of multiple cargo ships, a visit by the Olympic torch for a spacewalk photo op in early November and an unusual interlude with an expanded crew of nine astronauts and cosmonauts. The station has been staffed by a reduced crew of three -- Expedition 37 commander Fyodor Yurchikhin, Italian astronaut Luca Parmitano and Karen Nyberg -- since mid September when two cosmonauts and a NASA astronaut departed after a five-and-a-half-month stay in orbit. But the Soyuz TMA-10M launch Wednesday boosted the lab crew back to six just a few days before the delayed arrival of an Orbital Sciences Corp. Cygnus cargo ship making its maiden flight. 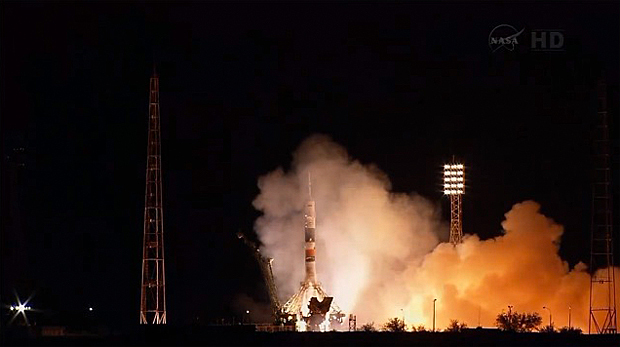 Soyuz TMA-10M commander Oleg Kotov, a space station veteran, rookie flight engineer Sergey Ryazanskiy and first-time NASA flier Michael Hopkins lifted off from the Baikonur Cosmodrome in Kazakhstan at 4:58:50 p.m. EDT Wednesday (GMT-4; 2:58 a.m. Thursday local time). Trailing a brilliant plume of flame from its liquid-fueled engines, the Soyuz booster climbed away to the northeast, launching almost directly into the plane of the space station's orbit. Hopkins is the first of his 14-member 2009 astronaut class to win a flight assignment. Raised on a farm in Missouri, captain of his University of Illinois football team and an Air Force flight test engineer, Hopkins made the climb to space strapped into the right seat of the cramped Soyuz command module. Kotov, the veteran commander, monitored cockpit displays from the center seat with Ryazanskiy strapped in to his left. The ascent appeared to go smoothly and live television from inside the cramped Soyuz command module showed all three crew members calmly monitoring their instruments amid routine calls to and from mission control near Moscow. "Vibration, oscillations, within norms," Kotov reported at one point. "Nominal operation of the systems." Eight minutes and 45 seconds after launch, the rocket's third-stage engine shut down and the Soyuz spacecraft was released into its planned preliminary orbit with a high point, or apogee, of 143 miles and a low point, or perigee, of 118 miles. The vehicle's solar arrays and navigation antennas deployed normally a few moments later. "Congratulations," someone radioed from mission control. In keeping with recent practice, Kotov monitored a four-orbit, six-hour rendezvous with the station, overseeing an automated approach and docking at the upper Poisk module at 10:45 p.m. as the two spacecraft sailed 260 miles above the Pacific Ocean just west of Peru. 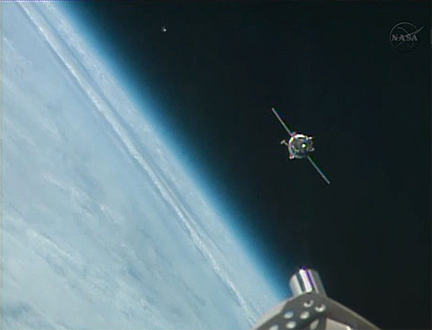 After waiting for residual motion to damp out, hooks and latches engaged, pulling the Soyuz snugly into place. Hatches between the two spacecraft were to be opened after a series of leak checks to verify an airtight, structurally secure seal. Asked what he was looking forward to the most about life aboard the International Space Station, Hopkins said "probably the first thing is just the experience of being able to float around. I just can't imagine what it's really going to be like. "And then, obviously, the other one is to just see the Earth from that vantage point, 250 miles up. We've all seen pictures of it, but to experience it first hand I think just has to be incredible." Yurchikhin and the expanded Expedition 37 crew face a busy month of science operations and work to unload one cargo ship and re-load another with trash and no-longer-needed gear	. Orbital Corp.'s Cygnus cargo craft, part of a commercial initiative to make up for the retirement of the space shuttle, took off on its maiden flight Sept. 18. Berthing originally was planned for Sept. 22, but the rendezvous was put on hold due to a navigation glitch. The spacecraft now is expected to arrive this weekend, pending installation of a software patch to correct the navigation issue. After the ATV's departure, Yurchikhin, Parmitano and Nyberg will strap into their Soyuz TMA-09M spacecraft on Nov. 1, undock from the Rassvet module's Earth-facing port and re-dock at the port vacated by the ATV. Yurchikhin's crew is scheduled to head home Nov. 11. They will be replaced by Soyuz TMA-11M commander Mikhail Tyurin, NASA astronaut Richard Mastracchio and Japanese astronaut Koichi Wakata, who will dock at the Rassvet module. Tyurin and Wakata are long-duration station veterans while Mastracchio is a veteran of three station assembly missions aboard the space shuttle. Normally, one three-person crew departs the station before their replacements arrive. But in this case, the Soyuz TMA-11M launch was moved up so the crew could bring an Olympic torch to the lab complex heralding the 2014 winter games in Soichi, Russia. This will be only the second time in station history that three Soyuz spacecraft and nine crew members have been aboard the lab complex at the same time. In a coincidence, Wakata was aboard during the earlier gathering in 2009. He will become the first Japanese station commander in March. Kotov and Ryazanskiy plan to take the torch outside during a spacewalk planned for Nov 9. The torch then will be brought back inside and will return to Earth with Yurchikhin, Parmitano and Nyberg. 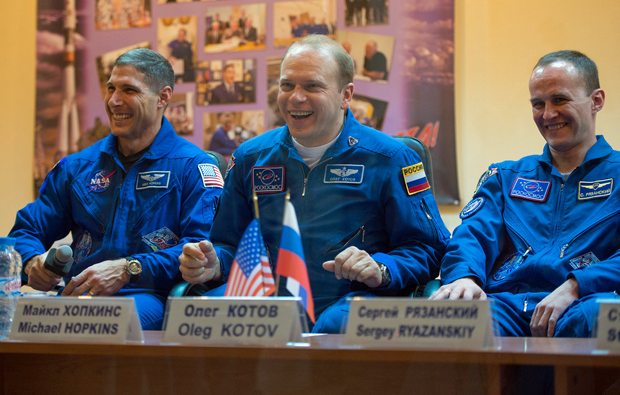 Between the Tyurin crew's arrival Nov. 7 and the Yurchikhin crew's departure four days later, the space station will host nine crew members, the most since the shuttle program's retirement. The expanded crew will have a busy few days with the torch spacewalk, a change-of-command ceremony, a joint crew news conference and, for three of them, packing for the trip home. In a pre-launch news conference Tuesday, Kotov said he and Ryazanskiy planned to take a moment during their spacewalk to talk about the torch and its significance. "Our goal here is to make it look spectacular, we would like to showcase our Olympic torch in space," he said. "So we will try to do it in a beautiful manner, I think a lot of people, actually millions of people, will be able to see it live on TV. They will see the station, they will see how we work during our spacewalks. But of course, there will be a couple of surprises." Kotov and his crewmates will still be on board when the games begin in March. He said Russian flight controllers promised to uplink events the crew might ask to see. "Of course, we won't have enough time to see everything," he said. "We'll be supporting our national teams and we'll be supporting those athletes who we like most. I'm sure that our colleagues on board the ISS will do the same and during dinners, we will be exchanging our impressions and our feelings about that." Two weeks after Yurchikhin, Parmitano and Nyberg depart aboard their Soyuz TMA-09M spacecraft, NASA and Russia will mark the 15th anniversary of the launch of the station's first module, the Russian-built, NASA-financed Functional Cargo Block, also known as Zarya. The supply and propulsion module was launched atop a Proton rocket on Nov. 20, 1998, followed two weeks later by launch of the first U.S. module, the multi-port Unity connecting node, aboard a space shuttle. Five days after the anniversary, on Nov. 25, an unmanned Russian Progress is scheduled for launch to carry supplies to the station and to test new hardware used for automated rendezvous and dockings. As part of the testing, the Progress will carry out a flyby of the station on Nov. 27 before docking at the aft port of the Zvezda command module two days later. NASA plans to close out the year with launch of an Orbital Sciences Corp. Cygnus cargo ship on Dec. 8, followed by a Russian spacewalk on Dec. 16. Hopkins said he looked forward to the busy schedule. "We have over 200 experiments that are going to get executed on the station while we're up there and that's certainly the primary role of the station and that's going to be very exciting to be a part of," Hopkins said. "A lot of the other work we do is just keeping the station running, routine maintenance. "We've got several visiting vehicles that are coming up, those are the supply vehicles, commercial vehicles, that should be arriving. And then, of course, the torch arriving. That's going to be extremely exciting. "We're going to have nine people on board the station at that time and there's going to be an EVA associated with that that's going to take the torch outside," he continued. "So it'll be very, very exciting, it's an honor to be able to participate in such an event." Along with his science and maintenance chores, Hopkins, a devoted weight lifter and physical fitness buff, will participate in NASA's "Train Like an Astronaut" program, posting regular updates and videos of his exercise aboard the station, along with tips from astronaut trainers at the Johnson Space Center in Houston. "I'm hoping to reach anybody and everybody I can with the physical fitness piece of it," he said. "For me, for my family, fitness, exercise, sports, it all plays a huge role. It's all about balance, too. So the work aspect, the family aspect, the rest, the exercise, it all needs to balance out. "I'd love to reach kids, because kids that start out with a healthy lifestyle, with exercise, with sports, are going to turn into adults that do the same thing. If I can reach adults and get them excited about exercising again ,or get them beyond that second week New Year's resolution to continue, I would love to do that." At the same time, he said, "I'm hoping to get people excited about space and what we're doing up there."